Two main concepts in the modern portfolio theory are the alpha and beta measures. They give the investor some information about the asset (a share, a fund, an ETF, for instance) risk compared with its benchmark, but both are quite different. 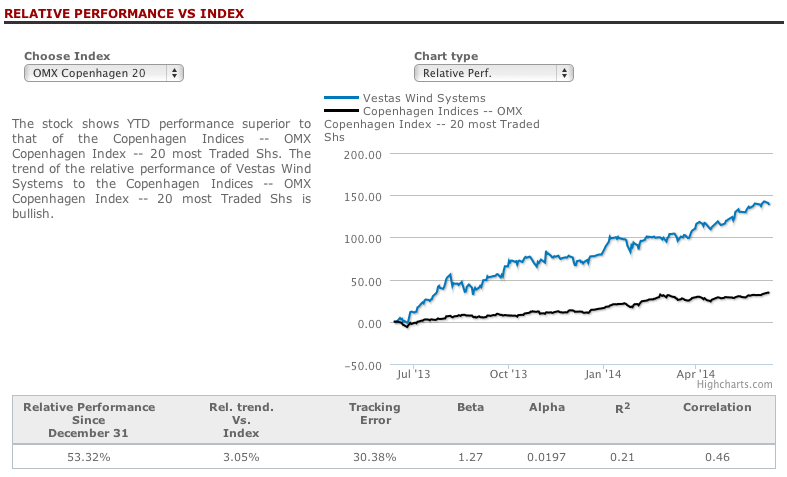 f we take our T-Advisor screen and choose an asset (for this case, Vestas Wind System), the T-Report from it has a chapter titled “Relative performance vs index”. We already wrote about correlation. Now, let’s explain what alpha and beta are and why they are important references for investors. Alpha shows the outperformance of the asset compared to its benchmark for an assumed risk. In the picture, the figure is 0.0197. That means: this asset performs better than the reference index. The higher, the better. This additional performance has to do with other reasons not linked with the benchmark. This measure appears also for funds and portfolios. A way to discover if the fund manager is good is just looking the alpha. What about beta? In this case, this figure measures the volatility or how much the asset varies in its price when the benchmark moves up or down 1%. If it is positive, the asset varies in the same direction as the benchmark. If it is negative, the variation is the opposite. For instance, in the example above, beta is 1.27. This means that the asset is more volatile than the index: when the index changes 1%, the asset does 1.27%. If the ratio would be less than 1, that means that the asset has a low volatility. Look for positives alphas but beware the beta together, because beta points how much risk you are accepting. For bullish markets, look for assets with high positive betas. On the contrary, for bearish markets, choose low or negatives betas. In this last case, the correlation is inverse. In all cases, the investor is choosing the risk exposure. T-Advisor provides the figures. How much you are exposed is a question of your own decision. This entry was posted in T-Advisorpedia and tagged alpha, beta, correlation, Performance, risk, volatility on June 12, 2014 by Oscar Garcia.